Join the discussion on our forums! 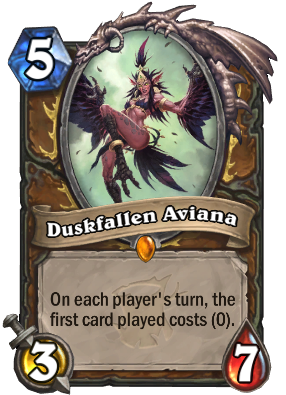 Come discuss Duskfallen Aviana over in our dedicated Duskfallen Aviana discussion topic. On each player's turn, the first card played costs (0). Someone called her "Tweety". She didn't take it well. This card was the first I got from the set back at release. But do not despair, comrades, I saw the truth! Alarm-O-Bot. Ultimate infestation for 0. Ironbeak or Spellbreaker for what mana I did use. Flawless victory! I still remember the day i was experimenting with a token shaman with The Storm Bringer. I was playing against a warlock. Near the late game he wiped my board two turns consecutively with Twisting Nether but after this i still managed to get three tokens on the board to use the legendary spell on them. One of the minions became Duskfallen Aviana. If my opponent kept one of his big removals he would have been able to destroy the strongest play of my deck and win the game. I won that game. Obviously it's impossible to predict such things will happen but it still bothers me that this trash card can easily ruin a game if it comes out of a random effect. This card is irredeemable garbage. And it was my free witchwood legendary. I still have it because i don't want to risk getting it from a pack. One day you'll stay alive for just one turn. Honestly this is probably the worst card in the entire game. My opponent played this when he had no chance of losing, Instead I got to play my N'Zoth for free and kill his board. Omg this card is so broken with Millhouse Manastorm! NERF IT BEFORE IT GETS OUT OF HANDS!!!! so...yah this cards not useless. Using this in a big druid deck or after playing "oaken summons" into a taunt minion, you can make some pretty good plays. Its also pretty effective against aggro decks because "why run minions into her when I can go face" she's actually pretty good if not conditional AF if not just for the reason most big minions in the meta are currently late game finishers that need to be built up like "shudderwok" or "void lord". i'm not saying she's god tear but she can work in the right decks. quick side note have an "iron beak owl" or "spell breaker" on hand after you play her just in case your opponent is running the "litch king". This is a card that requires board control prior to playing it (otherwise it's just a bonus for your enemy, you will never get to use it) but excels with big minion decks that can take advantage of the effect. For now it's bad. Can still become good in the future. I packed this, so I tried putting it into my odd taunt druid (actually decent, but more importantly, a really fun deck!). Despite putting it into my deck, I never found the opportunity to play it, because the tempo advantage I might be able to achieve was never ever worth the risk of giving my opponent the initative. Nothing is really game-winning enough when reduced to zero mana, except maybe ultimate infestation, but still.. While this card is very, very, risky, you can't deny the flavor text is a lovely reference. I had to get her as my free Legendary :( We already had an okay Aviana, they didn't have to go and print this bootleg version of her. They could have printed a different effect, and or used a different character instead of dragging her name through the mud. She'll be the fist thing to go if I want an epic. Hey that's cool that they brought her back! It's kinda like Magic where they have fresh iterations of planeswalkers. I'd almost get her if I knew a way to use her. Maybe use her for an early ultimate infestation? Wouldn't work too well vs a battlecry damage/destroy like shaman elementals have (I think).